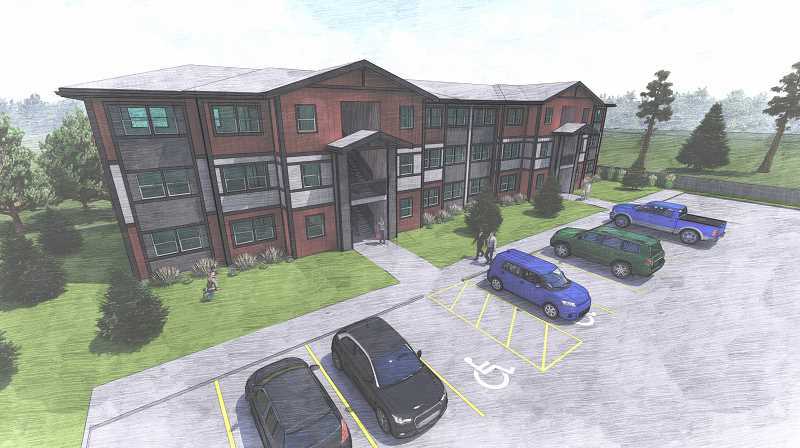 Housing Works is excited to announce the funding of Red Canyon, an affordable, multifamily housing development in Madras and Redmond, through the Oregon Housing and Community Service Local Innovation and Fast Track Housing Program. A total of 90 affordable units are planned between the two development sites. "Both Redmond and Madras desperately need more affordable housing," said David Brandt, executive director of Housing Works. "With vacancy rates still painfully low throughout Central Oregon and many renter households burdened by housing costs, these new communities will provide affordable homes to 90 low-income families. We are hopeful to have these new apartments completed by the fall of 2020." The development site in Madras is located on a parcel totaling 1.27 acres just north of the Madras commercial district and adjacent to Canyon East. The new community will consist of 23 two-bedroom apartments for low-income workforce households. Site plans include community rooms, fire pits, fitness trails, playgrounds, covered entries and decks, storage and ample parking. Housing Works' commitment to quality construction and resident services sets its properties apart from other multifamily properties in the region and supports the agency's mission of "fostering dignity through housing." The current concept for the Redmond development will provide much-needed affordable housing for 67 low-income workforce households. The development site is located in an established, multifamily neighborhood and is less than a mile from elementary and middle schools, grocery stores, restaurants and other resources. Housing Works plans to build a mix of one-, two- and three-bedroom units on approximately 3 acres near the intersection of Reindeer Avenue and Canal Boulevard in Redmond. As affordable properties, both communities will have rents well below market rates and will be restricted to households with income at or below 60 percent of area median income. This is the second competitive LIFT award that Housing Works has received from OHCS's new affordable housing program. Housing Works recently leveraged $3.4 million in LIFT funds to build 48 apartments in Sisters and 42 apartments in La Pine. Oregon Housing and Community Services resources include LIFT program funds, 4% low income housing tax credits and Oregon Affordable Housing Tax Credits. Housing Works hopes to begin construction on both communities by fall 2019. Build time is expected to be 12 months. Preleasing for these new apartment communities will begin approximately three months prior to completion through EPIC Property Management. Housing Works, the largest affordable housing provider in Central Oregon, provides people with quality, safe and affordable homes. Through a number of collaborations, it also provides the resources to help people stabilize their lives. Housing Works developments in Madras, Bend, Redmond, Prineville and Sisters have won awards for innovation, economic impact, design, and beautification. For more information, visit www.housing-works.org.